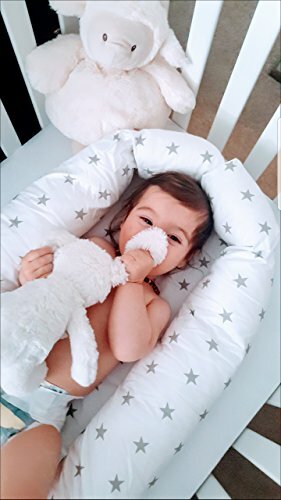 Your family sleeps well, because you use a baby nest! I am not a new seller. I have 2 shops in other services with a 3 000 happy customers. • NEWBORN size. Age: 0+ (up to about 12months) • SIZE: outer measurements 20x31", mattress: 12x28"
• Middle size. Age: 3+ (up to about 24months) • SIZE: outer measurements 20x35,5", mattress: 14x31,5"
•Toddler size. Age: 6+ (up to about 36months) • SIZE: outer measurements 23,6x45", mattress: 15,7x39,4"
Nest comes with removable cover, you will be able to take the padding and mattress out and wash cover separatelly in the washing machine. All our MATERIALS are certificated, hypoallergic, breathable and non-toxic. Cover fabric is 100% cotton. Inner mattress is removable 2cm foam in the cotton cover. Bumper filling is polyester fibers - breathable insulation for kids clothing. Baby can sleep all night long in my nests. As it is handmade items, they were tested only by my little "clients". ★Great idea for the transition from mom's abdomen to cot. ★ You can put in the baby nest between you in your bed, without any worries to make a harm for a little baby while sleeping at night♥. ★Or just put the baby nest in the crib or bed. ★You can use it as a changing or playing math. ★Take the babynest in the pram or while traveling. Always a safe and secure feeling. Tip: do not walk around with your baby in the baby nest and place always the nest on a flat surface! WASHING INSTRUCTIONS: remove the mattress and padding if possible before washing; wash the whole nest or the cover in the washing machine at 40 °C; do not tumble dry the nest; wash mattress by hand, dry it on a flat surface. DELIVERY TERMS: I ship my items during 3-5 days after getting your order. Delivery takes to Europe 2 weeks, Ireland, Italy, and Israel up to 4 weeks. The rest of the world 2-4 weeks. I have no opportunity to make delivery faster. Some delays are possible, because of the post. View More In Nursery Furniture. If you have any questions about this product by Babynest, contact us by completing and submitting the form below. If you are looking for a specif part number, please include it with your message.